We are very proud to announce the launch of our new eBook ‘UX & Conversion from a holistic SEO perspective’. It offers a holistic SEO view on both User Experience as well as on Conversion Rate Optimization. The information mostly is non-technical and can be read and understood by anyone owning or maintaining a website. The sale of our new eBook will start coming Tuesday, October 6. Early birds will get a discount: the eBook will be available for only $14 (instead of $19) this October! Don’t want to miss the discount? Subscribe to our newsletter here! A holistic SEO approach requires an amazing website. An excellent user experience is a very large part of that. At Yoast, we’ve been giving SEO advice for quite some time now. And although Google has changed its algorithm quite a few times, most of the advice we give at Yoast has remained the same over the years. And this advice is very simple: you just have to make sure the experience users have on your site is really really good. Do not use any ‘SEO tricks’; while they might get you rank quickly, they usually don’t work in the long run and might even backfire. A holistic SEO approach focusses on all aspects that can make a website great: ease of use, high quality content, excellent site speed… and so on. In our holistic SEO view, the usability of and the UX on your website should be a very important part of your long-term SEO strategy. Having an awesome website with high quality content and a great user experience won’t instantly improve your ranking. In the long run though, it will definitely have a positive effect on your SEO! Attractive websites have a lower bounce rate and a much higher chance to receive social media attention. These are exactly the two things that make sure your website will keep ranking well. Awesome websites will also result in higher conversions. If your audience likes and understands your website, the chance of them buying your products or become a returning visitor is much higher. You could improve your conversion even more by Conversion Rate Optimization. This actually is, next to SEO, a good supplementary strategy. SEO makes sure that more people find your website. A conversion strategy focuses on the visitors on your website, turning these visitors into customers. In our vision, you should always combine SEO and Conversion Rate Optimization. This means that you focus on attracting more people to your website and at the same time focus on increasing the chances that people will actually buy your stuff. That’s a double payoff! 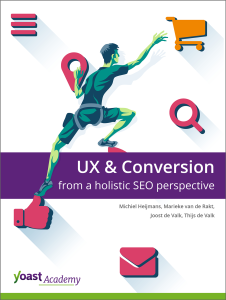 Buy the UX & Conversion eBook! Do you want to integrate better user experience elements into your website? Want to make your site more user friendly as part of your very own holistic SEO strategy? And optimize your conversion even further? Stay tuned and buy our UX & Conversion eBook as of October 6! Ask Yoast: do I need to optimize all of my product pages?